Sierra Club Florida News: VICTORY against Big Fertilizer, Big Pest Control, Big Turf! VICTORY against Big Fertilizer, Big Pest Control, Big Turf! Under the Clean Water Act, local governments are responsible for their local water quality, but this year, for the 6th consecutive year, lawmakers in Tallahassee proposed legislation to take away local control of water pollution - to preempt the nearly 50 strong urban fertilizer ordinances that have been adopted by local governments since 2007. This year the bills, HB 421 and SB 604 (Limited Certification for Urban Landscape Commercial Fertilizer Application) were aimed at gutting local fertilizer ordinances by exempting commercial fertilizer applicators from all summer rainy season bans. The summer rainy season ban is the backbone of meaningful fertilizer management and ordinances without the ban are essentially meaningless. The effort to kill these bad fertilizer bills is a true grassroots success story! This year the story starts in Tallahassee where Sierra Club volunteers and staff traveled to the Everglades Water Supply Summit in Tallahassee in mid-January and lobbied legislators urging them to vote against HB 421 before the Military and Community Affairs Committee heard the bill. We attended the committee meeting that week and spoke out against HB 421. Simultaneously, volunteers on the ground throughout Florida began generating phone calls into Representatives’ offices. The grassroots pressure was so loud that the bill sponsor asked to “temporarily postpone” the vote – it was clear that we had the necessary “no votes” to kill the bill and the sponsor needed time to rally the votes he needed to pass the bill through committee. Sierra Club activists voice their opposition loud & clear! 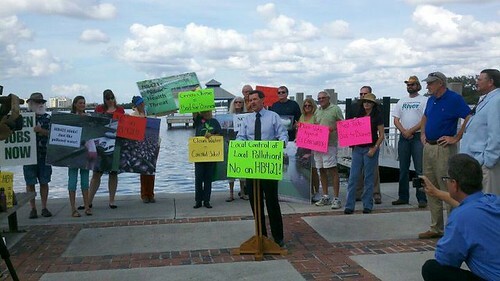 While we waited for the next committee vote on HB 421, Sierra Club, other clean water organizations and local elected officials organized four press conferences throughout Florida – in Clearwater, Sarasota, Ft. Myers and Stuart. The press conference sent a loud message to legislators in Tallahassee, as well as the media, that local governments, organizations, businesses and citizens wanted to keep their local urban fertilizer ordinances in place. Despite the building political pressure to kill the bad fertilizer bill, the sponsor worked the Tallahassee system and turned just enough legislators to yes votes the next week when HB 421 was addressed again in the Military and Community Affairs Committee. A very similar process was followed in the Senate Environmental Preservation and Conservation Committee: We knew our grassroots approach was working so we got on the phones, urging citizens, business owners and even progressive landscapers to make calls into the committee members’ offices urging them to vote against SB 604. Again, when it became apparent we had the “no votes” to kill it, the bill was temporarily postponed. We knew it was now time to turn up the heat. Both SB 604 and HB 421 were based on the claim that the pest control and fertilizer applicators could be trusted to self-regulate, but just days before the committee vote the Pinellas County Water Resources Department provided bombshell photographs of commercial landscapers applying fertilizer during a rainstorm- a violation of the industry’s own rules and local ordinances. Sierra Club coordinated a press conference, in Pinellas County, our 5th press conference in two weeks, to highlight the photographs - proof that the industry cannot be trusted to self-regulate when it comes to fertilizer management. 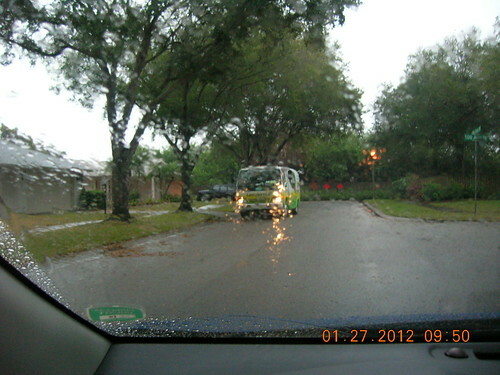 Fertilizer being applied in a rainstorm- a violation of the industry's own rules and local ordinance. We also took our story to the editorial boards in Tampa, Sarasota and Fort Myers urging the editors to speak out to protect local water quality. Both the Tampa Bay Tribune and Fort Myers News-Press responded by publishing editorials in opposition to SB 604 the morning before the vote. When SB 604 came up for a vote the following week in the Environment Preservation and Conservation Committee, our local elected champions travelled once again to Tallahassee and the committee rejected the fertilizer preemption bill with 3 votes in favor and 4 against. The bill was officially dead in the Senate for the year! For the sixth year in a row, Sierra Club helped secure a victory for our waterways in the face of great pressure from the biggest names in lawn care - Scotts Miracle-Gro and TruGreen - and the powerful Florida Turf industry.